Lemons are prized for their refreshing and nutritious fruit that is a popular ingredient for cooking, marinades, or juiced for lemonade. Lemons are very high in vitamin C and a common addition to remedies for soothing a cold or sore throat. Commercially lemons can be found in many cleaning products and homemade versions are easy to create. 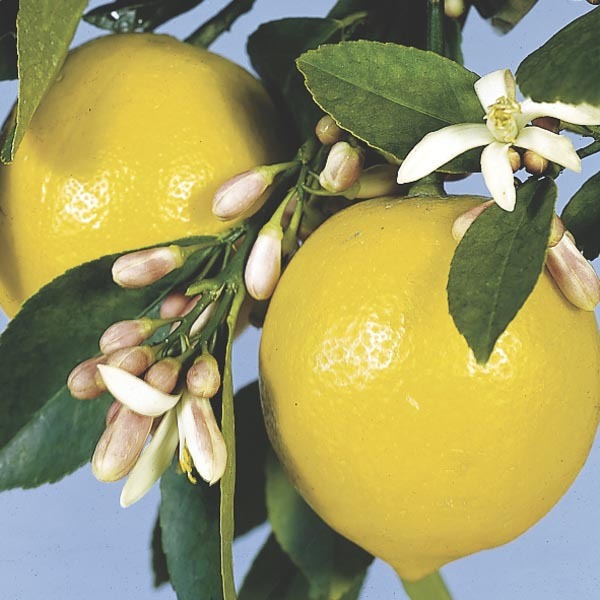 Utilize citrus trees in the landscape just like any ornamental tree. Give enough space that light is available from all sides, away from the shade of larger trees or buildings. A great plant for large patio containers where the fragrant flowers can be enjoyed and the fruit easily picked. Can also be grown indoors if space and ample sunlight can be provided. Apply a complete fertilizer formulated for fruit bearing varieties. Plant where tree is accessible from all sides so that fruit can be easily harvested as it matures. Apply fertilizer formulated for citrus trees in late winter into early spring. Prepare fruit by peeling away the outer skin, slicing, or squeezing for juice.